Fujifilm has manufactured an impressive line of medium format rangefinder cameras over the years, including the innovative Auto-Focus Point and Shoot GA645 and GA645Zi, but the GF670 has to be one of the most drool worthy cameras of this series. 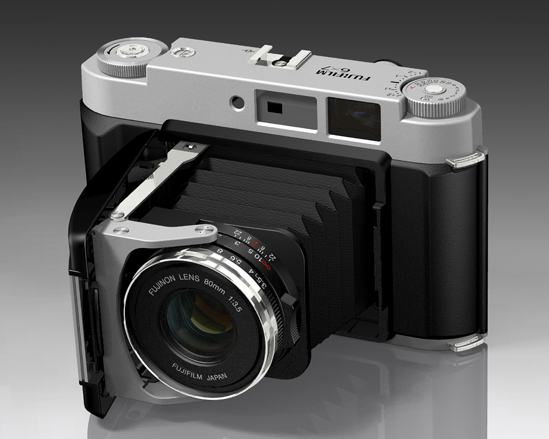 This Retro-styled medium format folder sports and EBC Fujinon 80mm f1:3.5 lens, switchable frame formats of 6x7 and 6x6, aperture priority automatic and manual exposure control, and rangefinder focusing. The in lens leaf shutter has speeds from 1/500th to 4 sec. with a B setting for longer exposures and a lens aperture range of f1:3.5 to 1:22. Other Features include AE Lock, +/- 2 stop exposure compensation, ISO range of 25 to 3200 and automatic parallax correction. More on the GA67 can be found on Fujifilm USA's website and Camerapedia.